IPL 2019: It is going to be a daunting 183 chase for the Royals. 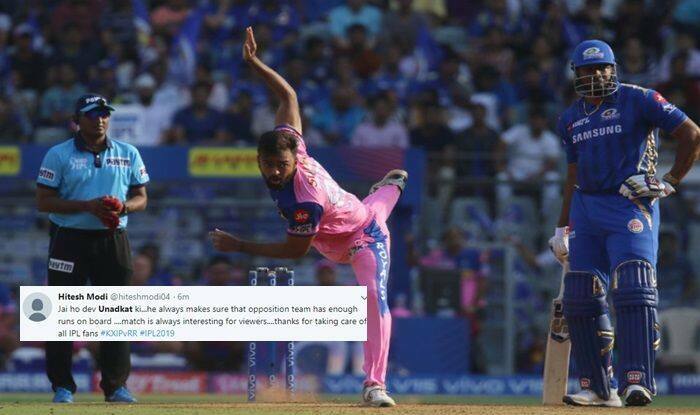 IPL 2019: Rajasthan Royals left-arm seamer Jaydev Unadkat was expensive against Kings XI Punjab. Unadkat conceded 48 runs in his quota of four overs as Chris Gayle and later KL Rahul took a liking to him. He picked up merely one wicket and that of Rahul for 52 off 47 balls. He conceded 12 runs every over which allowed KXIP to get to a formidable 182. This did not go down well with fans as they trolled Unadkat. While going through the scorecard, L Sivaramakrishnan just said “Unadkat was always going to be expensive”. At the time of filing the copy, the Royals had already lost Buttler for 23 and were 67/1 in seven overs. Opener KL Rahul cracked a patient fifty before a terrific cameo by skipper Ravichandran Ashwin powered Kings XI Punjab to a challenging 182 for six against Rajasthan Royals. Rahul, who was named in the World Cup squad on Monday, recovered after a slow start to post a 47-ball 52 studded with three fours and two sixes. He was ably supported by David Miller (40 off 27) as the duo shared a 85-run stand to lay the foundation. Archer then had him caught behind by Sanju Samson in the sixth over as KXIP were 39 for one in the first powerplay overs. Playing his first IPL game this season, New Zealand’s Ish Sodhi was then introduced into the attack and Mayank Agarwal (26 off 12) clobbered him for a six in the fourth ball.